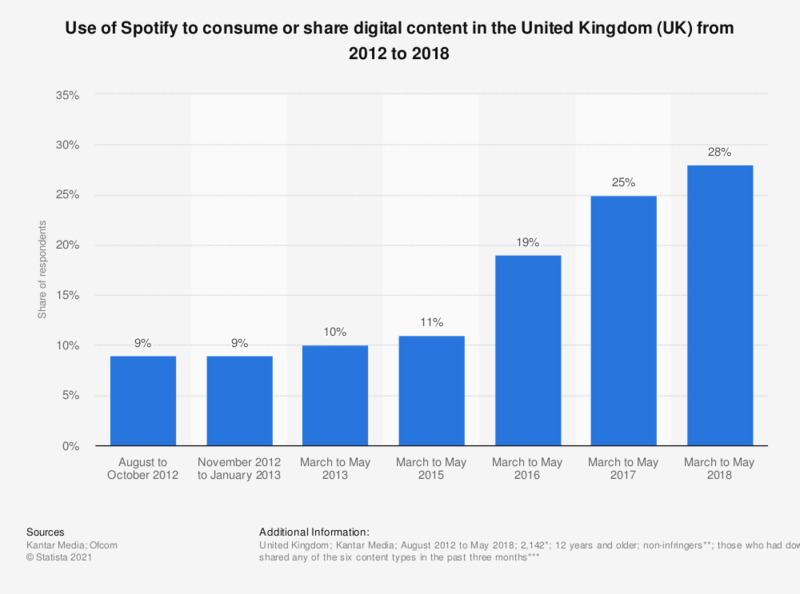 This statistic shows the share of legal digital content consumers that used Spotify to consume and/or share digital content in the United Kingdom (UK) from 2012 to 2018. As of the most recent survey wave, ending in May 2018, 28 percent of respondents reported using the online service (3 percent increase compared to the previous wave of survey). * Base of most recent survey wave (Wave 8). Base varied by wave: n (W2) = 2,062; n (W3) = 2,206; n (W4) = 2,034; n (W5) = 1,171; n (W6) = 2,284; n (W7) = 2,254. ** Only respondents that reported having consumed no illegal digital content.